We originally shared Nanny’s Black Midnight Cake here on A Family Feast almost five years ago. After making this cake again recently, we decided to take some new photos and re-share this delicious chocolate cake recipe. While the cake photos are new, the photos of the kids in our family are five years old, and those cute little kids are now a lot more grown up! My husband Jack and his brothers and sisters all have very fond memories of their mother (Nanny to us) baking this delicious Black Midnight Cake – a dark, chocolate layer cake with a rich dark chocolate frosting. It’s perfectly sweet and super moist and light, and if you are a chocolate lover – this is the cake for you! Jack and his siblings (as well as a few cousins who had an uncanny knack of always showing up for dinner whenever Nanny made this cake for dessert) would fight over who got the biggest piece of cake – it’s so good! Years later, the younger kids in our family all love this cake too. They did a fantastic job baking this cake – don’t you agree? And Nanny loved the cake too – of course! 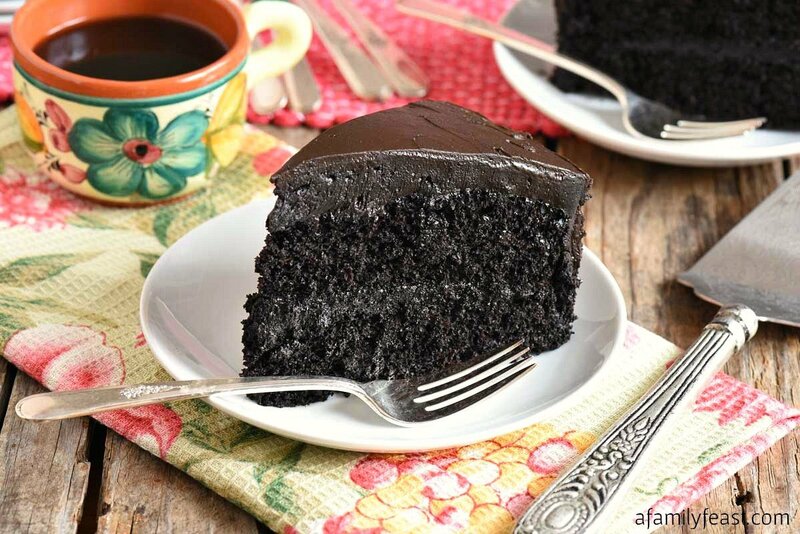 This black midnight cake recipe is adapted from one originally published in the Betty Crocker Cookbook many years ago with some updates of our own, as well as additional inspiration thanks to the cake recipe on the back of the can of Hershey’s cocoa. We’ve updated it to include some coffee as well as a pinch of cayenne in the batter – both ingredients really enhance the flavor of the chocolate. Watch the baking time. Check after 20 to 25 minutes to see if your cake is done, especially if your oven runs hot, or you are using dark metal cake pans. Slowly add in coffee/cocoa mixture, buttermilk and vanilla and beat until batter is smooth. Scrape paddle and bowl and beat once. In a separate bowl, sift flour, salt, baking soda and baking powder. Add dry ingredients to wet and beat on low speed to incorporate. Scrape down bowl and mix just until all ingredients are combined, do not over mix once flour is in. Bake 30-35 minutes or until a tooth pick inserted into the center comes out clean. Depending on your oven, you may need to rotate cake pans half way through. During our baking, one cake was done in 30 minutes and the second in 32 minutes. Do not over bake. Cool pans on wire racks for ten minutes then carefully invert out of pan onto rack to cool further. What size cake pans did you use? Hi – We used 9-inch pans but 8-inch will also work. The 8-inch pans will yield slightly thicker layers and you may need to adjust the baking time. Because I think you’ll use smaller pan than I use and it looks thin when I divide into two. Yes – we used two pans. The batter will rise as it bakes. 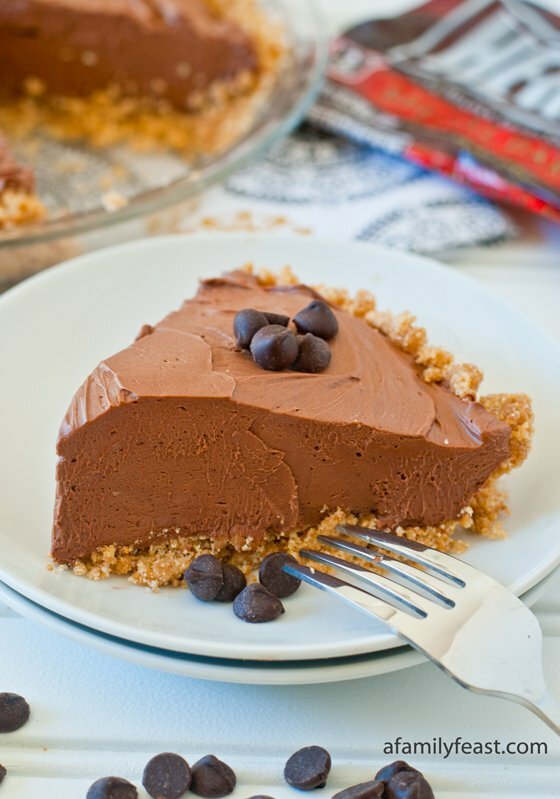 This looks so good I want to try this and make a mousse to go in the middle of the cakes. This is the driest cake I’ve ever made and eaten in my life. I will not follow the instructions if I make it again. Add extra oil if you decide to give this recipe a try. So sorry to hear you had issues with our recipe Gin! I love these recipes, so many recipes to choose, Ive got a sister thats asking me for a really nice Chocolate Cake recipe. I’m an average baker & decorator. So I trying Chocolate Cake recipes. I’ll make & present these Chocolate Cakes to my family, there in for treat of life time. All these Cakes are just incredible. Thankyou. You’re very welcome Glenis! Enjoy! Hi. What’s the size of the cake pans?? Hi Laba – Great question! We used 9-inch cake pans. 8-inch pans will also work (the cooking time will vary a bit). What a beautiful family activity. Just think someday they’ll do the same with their families. Generations of the past will live on in yours. Thank you for sharing. It’s truly a blessing. Hi, this looks absolutely delicious and I would like to try it sometime. I generally don’t use shortening in my cooking, do you have any tried and tested suggestions for shortening substitute for this recipe? Thanks! Hi Trish – No – I’m sorry, we’ve only made this recipe as written in the posted recipe. Flavor was good, but the cake was dry as the Sahrara. Won’t make again. Sorry to hear Mary Anne! This cake sounds delicious. I live in Denver. Is this recipe for high altitude? Thanks. Hi Marjie – I’m afraid I don’t know how it will bake in a higher altitude. Sorry I can’t be more help! Does this cake need to be kept refrigerated once made? It looks delicious. I think I will make it for a dinner at our church. Hi Tom – It should be OK for a day or two without refrigeration. The frosting might be soft but it should be fine otherwise. No – it should be OK at room temperature for a day or so! Hi Sherry – You really won’t taste the coffee as a standalone flavor in the cake – it just enhances the flavor of the chocolate. But if you’d rather leave it out, just replace it with water. The cake will still be very chocolatey. Hope you enjoy it! This is the best chocolate cake recipe. It is so moist. This is a cake you might find at a 4 star restaurant. Very very good! Thank you so much Janie! We’re so glad you enjoyed the recipe! Just discovered your blog and I am thoroughly enjoying browsing! Love how dark this chocolate cake is–mmm….. I wonder how this recipe would work in a 9×13 pan. Have you tried it? Hi Wendie – we haven’t tried this in a 13×9 pan – but I’m guessing it would be fine! Let us know how it comes out! Fabulous cake and wonderful job by your bakers! What an absolutely fun cake for the kids to make!!! I am dying over how deep and dark it is…I need this cake for sure!!! Cute pictures! The best part is always licking the spoon! This cake looks incredible Martha! Thanks Tanya! The kids had a great time!